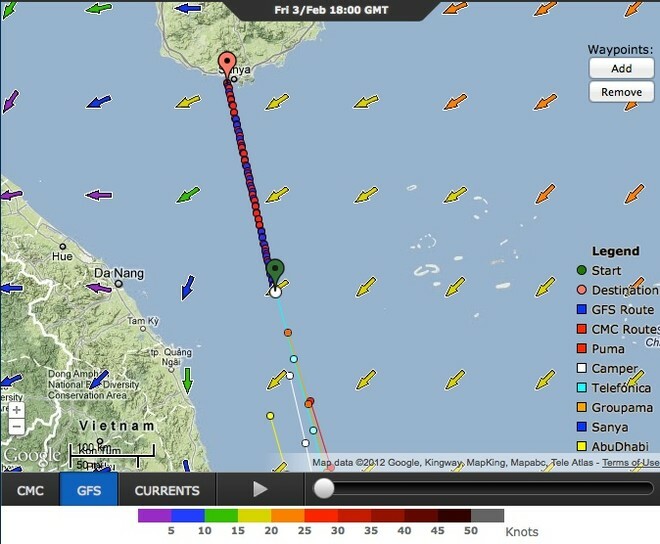 With just over 100nm to sail to the finish line in Sanya, China, Telefonica looks set to take her third ocean leg win. According to the routing options from PredictWind, at 1900hrs UTC on 3 February, the Iker Martinex skippered Spanish entry, just has to sail the direct course to the finish, and should be able to average 15-17kts for the remaining distance. She is in a direct line between the yachts immediately astern of her and the finish line in the Chinese resort of Sanya, which lends its name to the sixth placed yacht in the race. Given the position of the yachts at the head of the feelt there would seem to be no passing lanes and the finish line places will be Telefonica, followed by Groupama (Franck Cammas) and Camper (Chris Nicholson). The leg win will add to the points lead that Telefonica holds, while Groupama will catch up to Camper on the points table. An earlier report posted on VolvoOceanRace.com reviews the breakpoints on the second stage of Leg 3, which got underway from the Maldives, after the yachts were shipped again from abu Dhabi, to avoid interception by pirates operating out of Somalia. Overall race leaders Telefónica finished the first stage of Leg 3 — a one day sprint from Abu Dhabi to Sharjah — in fifth, before the fleet was loaded aboard a secure cargo ship and transferred through a high risk piracy zone to the then secret safe haven port of Malé in the Maldives. Martínez’s crew had languished in last place early in the second stage of Leg 3 after damage to their key code zero headsail hours after the start had slowed them down for a full day. Telefonica on a direct course to Abu Dhabi, with the fleet astern. By the time the fleet reached the first turning point on the north west tip of Sumatra, however, Telefónica were back to full speed and took the lead after smartly positioning themselves as the most northerly boat. 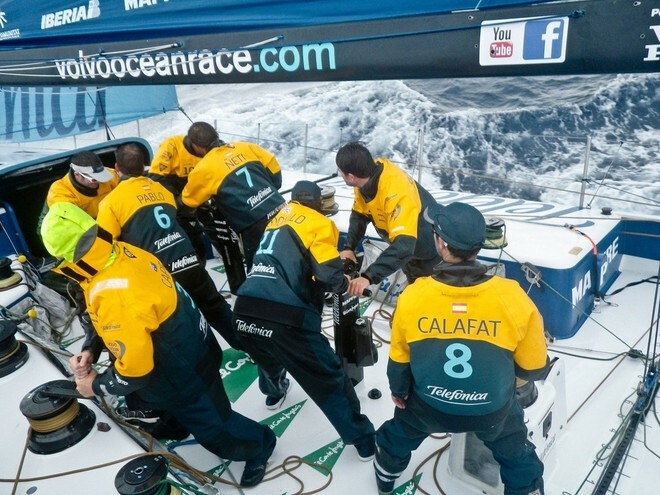 Speaking from the boat today, Martínez put Telefónica’s comeback down to the hard work and resilience of his crew. Despite their healthy lead, Martínez said the Telefónica crew had been unable to back off for fear of losing their lead in the closely packed fleet. After losing miles when their mainsail control line broke overnight, Groupama skipper Franck Cammas conceded that, barring a disaster for Telefónica, the French team would have to settle for second place into Sanya. ‘The main sheet broke when we were sailing off Vietnam,’ he said. ‘We heard a bang and 10 seconds later it was gone. ‘We changed all of it. We lost five or 10 miles but we fixed it easily with the spare one. It could have been dangerous but nothing happened. ‘I think Telefónica has a strong safety margin now. They made gains today and they have such a margin that I have little hope. Behind Groupama, a fierce battle was brewing for the final Leg 3 podium position between Chris Nicholson’s third placed Camper with Emirates Team New Zealand and Ian Walker’s fourth placed Abu Dhabi Ocean Racing. Walker’s crew won the opening stage of Leg 3 and, if they remain in fourth, will be tied on points for the leg with Camper. 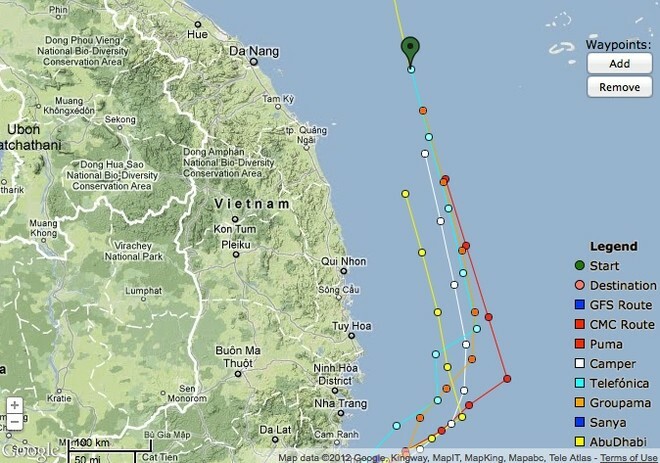 Both crews expressed relief at being able to get away from the Vietnamese coast after each narrowly avoiding collisions with floating debris and unmarked hazards. Camper navigator Will Oxley said the crew had narrowly avoided disaster on more than one occasion and had been slowed by fishing nets on their keel several times. ‘With poor quality charting multitudes of unlit fishing vessels and miles of nets not to mention shallow wrecks from the war, the potential for disaster was high,’ he said. Abu Dhabi skipper, Ian Walker said that his team had been close to sustaining major damage in the night when they had to swerve at the last second to miss an unlit metal navigation buoy. ‘We missed it by a metre and for sure it would have made a big mess of our bow,’ he said. Walker added he was uncertain if Abu Dhabi would be able to close down Camper before the finish. In fifth, Puma looked to be hoping a final roll of the dice could help them pull back at least one place as they positioned themselves to the east of the pack to benefit first from better winds. At 1300 UTC they remained in fifth but were averaging one knot faster than the other boats. Puma Media Crew Member Amory Ross said the team were exhausted but resigned to having no chance to rest before they got ashore as they fought their way to the finish. ‘The strategy from here seems simple: don’t give up too much leverage and play each shift like it’s the last,’ he said. Leaders Telefónica are expected to complete the second stage of Leg 3 in Sanya some time after 0430 UTC (1230 local time) tomorrow February 4, with Groupama, Camper, Abu Dhabi and Puma all expected to finish later that day. Team Sanya are expected to receive a warm homecoming welcome the following day February 5 at around 1300 UTC (2100 local time).